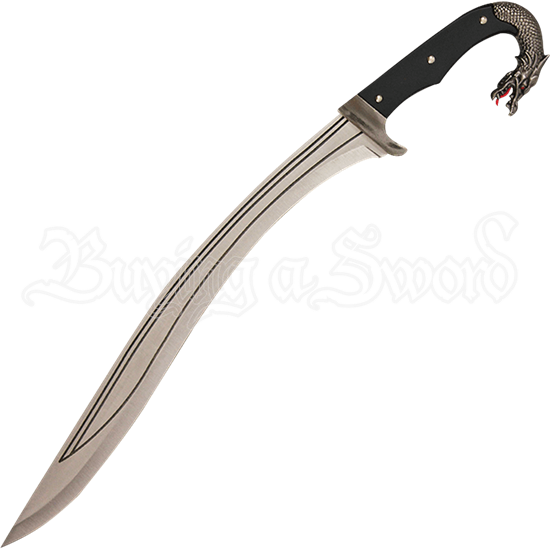 The origins of the falcata-style sword, an example of which can be seen in the Black Dragon Falcata and Dagger Set, are believed to be sacrificial blades used in Iron Age rituals. Use these blades to sacrifice enemies to dragons! These dragon themed, stainless-steel, weapons possess gently curving blades that feature slight swells near the tips for optimal chopping power. The handle of the falcata sword is colored black and shaped like the arching neck of a dragon. The curved pommel of the blade is shaped like the head of a dragon, who sits open-mouthed, showing its red tongue. The dagger is but a smaller copy of the sword, minus the dragon head on the handle. Even the scabbard for these weapons are aesthetically pleasant - along the outside of the sword scabbard, banded in stainless steel, is set a smaller scabbard for the dagger, so they can be carried together in a stylush and efficient manner. Two rings are attached to the back of the scabbard for hanging on a belt. Decorate your home with this functional set of blades or use them in your cutting drills! Give it to a friend or loved one as a very special gift!